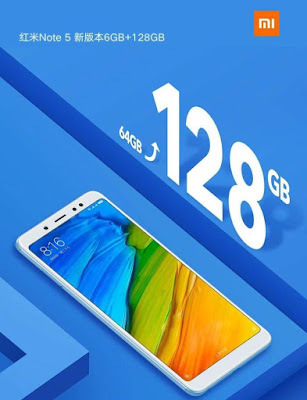 Xiaomi launched Redmi Note 5 Pro as Redmi Note 5 in China and Other Market Now Xiaomi has launched 6GB RAM with 128GB storage version of the smartphone in China. Xiaomi Redmi Note 5 has a 5.99-inch FHD+ 18:9 Display powered by Qualcomm Snapdragon 636 Processor. On Camera, it has a Dual Rear 12 MP IMX 486 sensor +5MP color sensor to capture depth information, there is also EIS for videos and 13MP front camera. The front camera also has support for the portrait mode. Redmi Note 5 comes with face unlock, face detection algorithm scans facial features in roughly 500ms using a high-accuracy matching mechanism.packed with a 4000mAh Battery supports Qualcomm Quick Charge 3.0. It runs on Android Oreo with MIUI 9 full-screen gestures support. Xiaomi Redmi Note 5 (Redmi Note 5 Pro) with 6GB RAM with 128GB storage version is priced at 1699 yuan ( Rs. 17,210) and will go on sale from July 27th.